I couldn't believe it when I looked it up, it really had been since June 2015 since I worked on that painting. Yep, I started a painting almost 9 months ago and put the project on hold soon after. 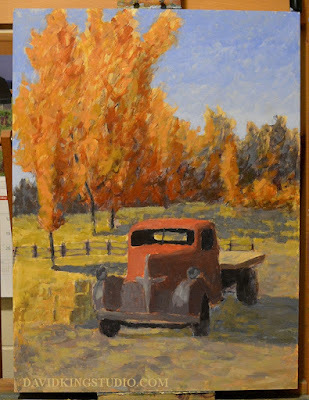 I could have sworn it was late summer when I took a "break" from that painting. 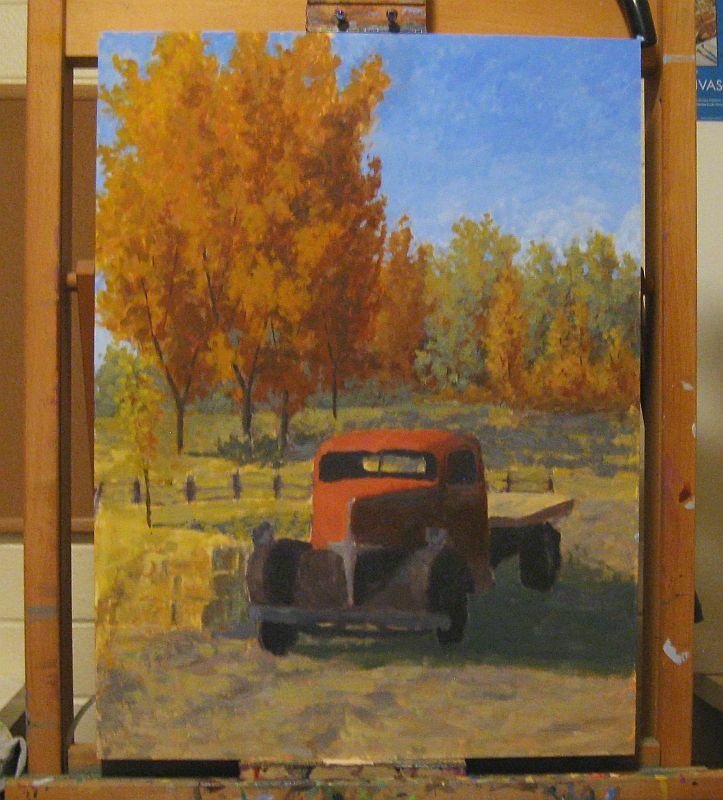 The WIP has even been sitting on the small table next to my easel the whole time. I finally decided it was time to rectify this situation and finish this beast. Rather than divert you to links that are nine months old I'll recap those old WIP posts here and add one new one. 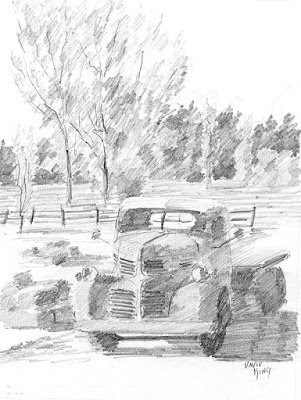 This painting is a little more complex than my paintings usually have been so I did more than just a typical thumbnail and made this small but somewhat detailed pencil sketch to plan the painting. It almost seems like some kind of badge of honor nowadays for an artist to proclaim that they do no planning and just jump in and go where the muse takes them. I suppose there may be some artists that are talented/gifted enough to get away with that but I can't help but think that they might get even better results if they put some thought into their design, or maybe they do and just want to create some kind of artist mystique but really do plan more than they claim. I don't know about other artists but I feel no shame in admitting that usually my best paintings are well planned first. This is usually the first step in making one of my paintings, though not all paintings get a full pencil underdrawing but those this complicated do, and as you can see the design has been refined somewhat as well. This gives me another design iteration before the paint hits the surface. 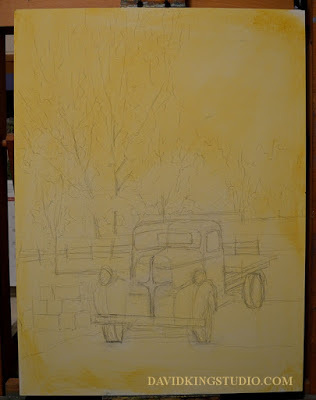 After the underdrawing was done I applied a coat of yellow ochre diluted with glazing medium. This layer serves two purposes. First it seals the gesso and the drawing. By sealing the drawing the graphite won't smear around while painting and by sealing the gesso the moisture won't be sucked out of my paint so readily and it will spread easier. Second it gives me a tone to work against rather than a stark white surface, however I wish I had gone a bit darker with my tone on this. Unless I'm painting with a palette knife my first layers are transparent. I like to find my way into the painting by gradually layering transparent paint and even use optical mixing by layering different colors over each other. Yes, most of this gets covered up opaque layers later but it's part of my process, it's part of my journey through the development of the painting. I never intentionally mix water into my paint, I always use glazing or gloss medium to dilute it and make it transparent. My experience is water tends to make the paint chalky or cloudy, or at least not as vibrant as it is using mediums. This is the last WIP photo I posted last June. 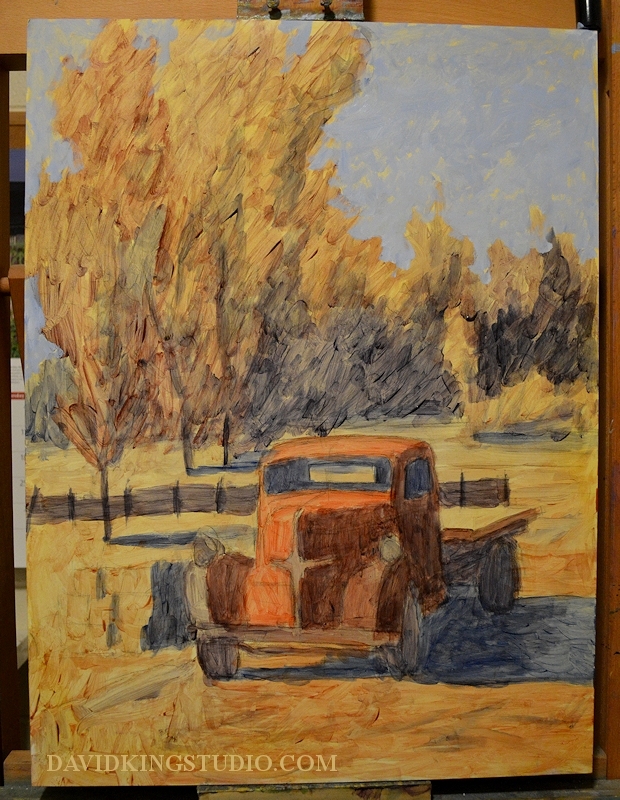 You can see now I've added some opaque layers, still gradually finding my way into the painting. Here is where the painting stands now, or rather where I left it last June but I never posted a WIP of this point before. Here you can see I've started refining shapes and adding details however that may be a bit premature, I'm guessing at most I'm only halfway through this painting now. I'm committed to finishing this thing up though so fresh updates will be coming shortly. Oops! I Lost My Color Again! In my last blog post I alluded to the fact that I've been playing with a long lost medium lately. Well, not long lost so much as neglected. I think I've tried just about every art medium on the planet so I have a lot of art supplies that seldom get used, charcoal is one of them. 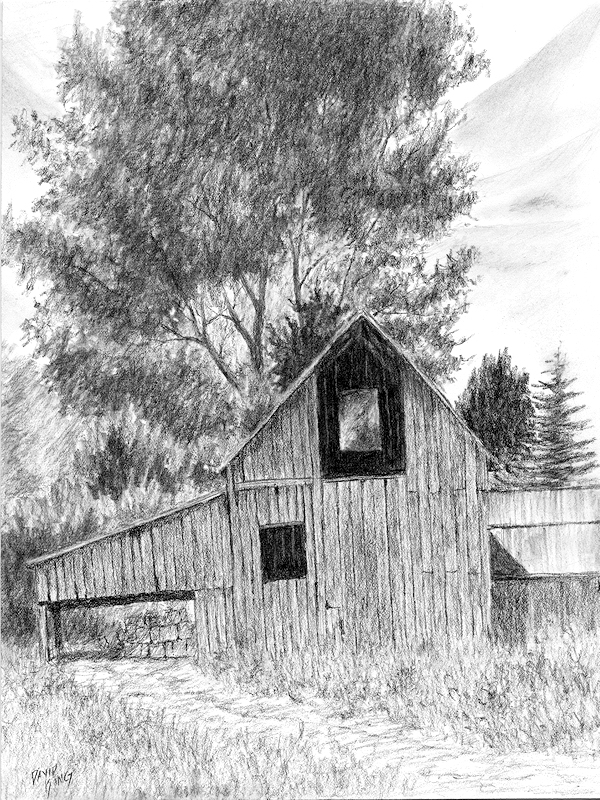 Charcoal on paper, 11.3" X 8.5"
"Midway Barn" is my first complete charcoal drawing. I﻿ used hot pressed watercolor paper. I have some paper labeled as being for charcoal but the texture was more aggressive than I like and it was a laid texture which means it has a mechanical weave appearance that just doesn't look natural. I might try Bristol smooth paper for the next drawing. There's something about the simplicity of using a single pencil to create a piece of art, it just feels so authentic and meditative while making it. The drawing is based on a photo I took in the small rural farming community of Midway, Utah in the Heber Valley on the opposite side of the Wasatch Mountains from Provo. Midway has lost a little of it's small town charm over the years though, it's become a popular resort area and much of the surrounding area has been developed. This barn however is just a couple blocks from downtown. I took some liberties by changing the shape of the barn a bit, removing a home in the background, adding a dirt road in front and making the field more "wild".